Firefox 5.0 beta 2 has been uploaded to the semi-official Firefox-Next Launchpad PPA (now called "Firefox Beta Channel PPA") for Ubuntu 11.10 Oneiric Ocelot, Ubuntu 11.04 Natty Narwhal, Ubuntu 10.10 Maverick Meerkat and 10.04 Lucid Lynx. Firefox Beta Channel PPA provides Firefox releases from the beta channel only, meaning you won't get highly unstable builds like the Mozilla Daily PPA. All new Firefox beta channel releases will be provided by this PPA, but with a delay because it takes some time to package new Firefox versions. At the time I'm writing this post, the Firefox Beta Channel PPA provides Firefox 5.0 beta 2 but depending on when you're reading this, you may get a newer Firefox beta. 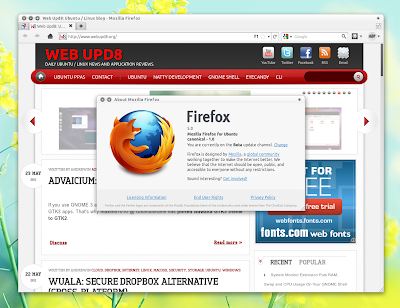 Since Firefox this PPA provides a beta Firefox version, you may find bugs. If you do, report them here.